ROELAND PARK — Bishop Miege senior Ruby Rios treasures the empty wine bottle that represents all the amazing accomplishments she’s attained in the past four years. “I’m just so honored,” she said. Rios, a parishioner at St. Peter Parish in Kansas City, Missouri, was recently named one of Kansas City’s Ink magazine “30 under 30” — the youngest person ever to be included on the list. “One of the awards they give you is a bottle of wine,” she explained. “It’s engraved with your name and the ‘30-under-30’ logo. If Rios’ past is any indication, she’s a minor with a major future ahead. Rios’ journey to notoriety began when she joined the Bishop Miege robotics club as a freshman. “I decided to take a course [at a Johnson County junior college] so I could learn some programming skills that I could use for my robotics team,” she said. Unfamiliar with the campus, Rios arrived late to her first class — and walked into a room full of only men. “Then I’m in the right place,” Rios replied and took her seat. The course was so demanding that by the end of the semester, out of 30 students, only seven were left. Rios was one of them. The experience taught her two things — first, that she is good at coding, and second, that most girls don’t believe they could be. “There’s nothing that prevented me from doing any better or worse than those guys,” said Rios of her experience. “It was me showing up, putting in the time and being willing to make mistakes that allowed me to succeed,” she added. Rios walked away from that class with a determination to make sure other girls realized they’re capable of doing the same thing. Rios proceeded with the intent to pursue that goal with a vengeance — and the results have been nothing short of extraordinary. She co-founded a group called KC STEMinists, which has received sponsorship from the U.N. Foundation’s Girl Up campaign. When Nobel Prize laureate Malala Yousafzai came to Kansas City, Rios was chosen to participate in a roundtable discussion about women in technology and global issues. At that meeting, she caught the attention of Cerner Corporation and was invited to be a cybersecurity intern through its Cerner Scholars program. She was one of 20 American girls chosen to spend two-and-a- half weeks in Malawi, Africa, at a Women in Science STEAM Camp, empowering high school girls to explore science and technology fields, as well as art and design. This month, Rios will travel to North Carolina to receive the 2018 National Center for Women and Information Technology (NCWIT) Award for Aspirations in Computing. And, of course, there’s that empty wine bottle. Rios fell in love with computers when she was 10 and went to an all-girls computer programming camp sponsored by the KC STEM Alliance. Wanting to learn more, Rios attended the camp again the following summer. This time it was coed. “I was the only girl,” she said. “That’s when I realized there was a disparity between men and women and STEM roles. Rios knew her confidence in computers began with the all-girl camp. So, when Martha McCabe, executive director of the KC STEM Alliance, invited her to assist with all-girl coding camps, she jumped at the chance. “She stood out as a leader at the camp even as a participant,” said McCabe of Rios. “She was so friendly and always willing to help another team if they were struggling with figuring out the coding. At the conclusion of the summer camps, participants and their parents approached Rios asking where they could go next. “That got me into Girls Who Code,” she said. Girls Who Code is a national nonprofit working to close the gender gap in STEM fields. With the help of the KC STEM Alliance and the support of Bishop Miege, Rios started a local club that’s now in its second year. It meets at Bishop Miege, but is open to any local students in 6th through 12th grade. “It is every week and it goes for two hours — it’s a big commitment,” said Bishop Miege math and computer instructor Joan Gladbach, the club sponsor. “We’ve had between 10 and 15 girls over the last two years. Gladbach would argue that point. “Ruby’s the facilitator of the students,” she said. “I’m there as support. Rios believes every opportunity in her life is a springboard to the next, and God is in charge of the plan. “God has worked in my life in so many wonderful ways,” she said. “He’s been there every step of the way, helping everything connect in my life. “My faith has been challenged by technology, especially in the beginning. Being the only girl in the room, I had to pray a lot. Meeting Yousafzai, she said, was life-changing. “Seeing someone who is only slightly older than you who made such a huge impact, and having them tell you that you can make that same impact — that’s empowering,” she said. McCabe remembers watching Rios during that event. “It resonated with her, watching Malala speak,” she said. “I think the message was: It’s great to have all these opportunities. But the thing you can benefit the most from, and provide benefit to, is in your own community, your own backyard. To a large degree, Ruby credits Bishop Miege for her accomplishments. She knew about its robotic club through an older brother who went there, and she was further impressed by the high school’s commitment to technology. “People look at our football team and our basketball team and our amazing sports accomplishments and think that’s what Miege has to offer. Through Project Lead the Way, Rios has taken engineering and advanced computer science classes. “[Miege has] allowed me to have the internship opportunity,” she said. 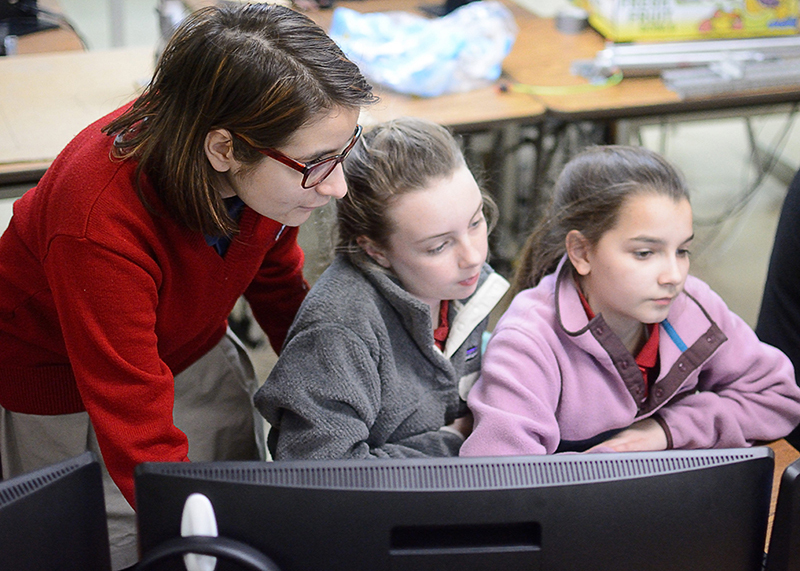 “They’ve allowed me to bring a Girls Who Code club into the school. When Rios needs a break from the grind of her technology-filled life, she dances. Though she no longer competes, Rios still dances for at least three hours a week. “I have a blast,” she said. “Tap dancing has been a big part of my life because I need exercise of some sort. Whether dancing or computing, Rios has a bright future ahead. She’s just completed her college applications, and is waiting to make a decision about where she’ll shine her light next. A lovely story. And beautifully written. I loved reading about Rio’s journey!Your website is amazing.You should put more of your stories in the newspaper.